"We gotta get out of here, I can't go back to jail!" 2001's Monsters Incorporated was one of the first Pixar films, but it also established Pixar as an animation company interested just as much in telling great stories as utilizing the latest technology. Unfortunately Pixar, of late, has turned their focus more to the latter and almost completely ignored the former. Cars 2 and Brave, while both gorgeous to look at, can hardly be viewed as torchbearers of the Pixar golden age of great storytelling. 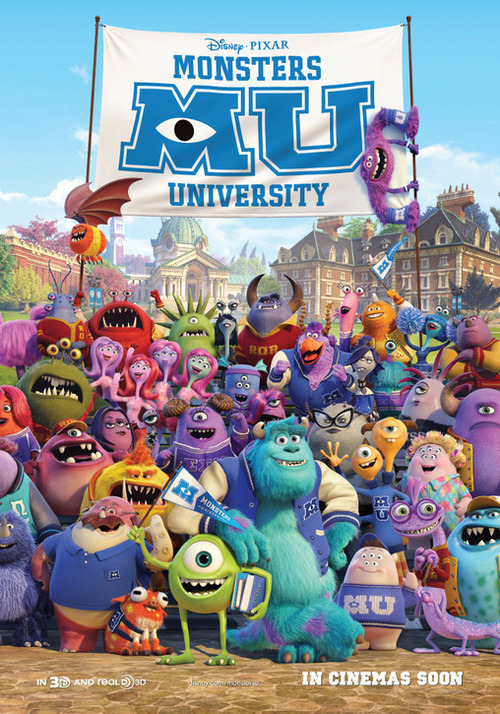 While I'm happy to report that Monsters University is a solidly enjoyable, largely entertaining film, it's hardly the kind of film that will draw cheers of ecstasy from the general public. Don't misunderstand me, even a middling Pixar effort, which this most assuredly is, is still better than the bulk of what lesser animation houses are churning out, but it's still a mostly forgettable and slight film. 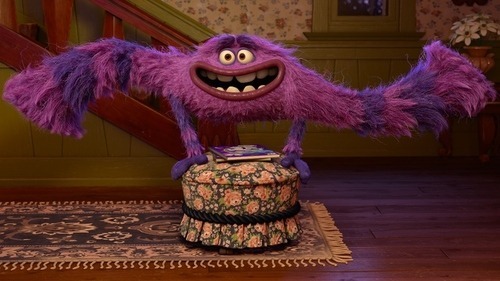 Mike Wazowski (Billy Crystal) is an idealistic young bookworm of a monster who discovers, on a field trip as a youngster, that he wants to be a "scarer" when he grows up, that is a monster that travels into the human world and scares children to harness their screams, which power the monster world. 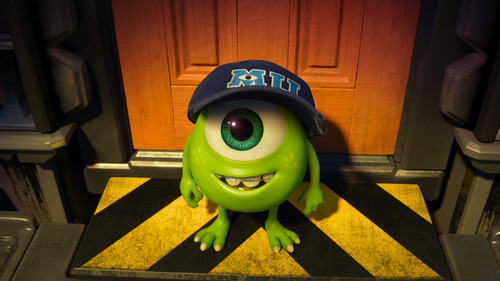 As a college freshman, enrolled in Monsters University's Scaring Program, Mike establishes himself as a smart & dedicated student, albeit one who everyone seems to agree just isn't scary enough to make it as a scarer. Mike's arch-rival is a young James P. Sullivan (John Goodman), a scare major with a rich family pedigree that seems to think he can just coast into a career as a scarer. When a mishap gets both scarers kicked out of the program, they're forced to join a second rate fraternity and compete in The Scare Games, a competition in which the winning fraternity gets admitted back into the Scaring Program. Can this scrappy bunch of misfits compete against major league competition from the other fraternities? Well of course they can, and will, and therein lies Monsters University's greatest fault... It's far too rote & predictable to be a Pixar film. Don't get me wrong, it's a beautifully realized world, full of tons of genuinely enjoyable characters, but to hang their story on such a well-worn pastiche as the age old "snobs vs slobs" underdog story is just lazy. The film has some nice nods to films like Animal House, Caddyshack and virtually any other film of this ilk you can think of, but that works almost wholly to its detriment because it has no identity of its own. It also falls victim to what I like to dub "prequel syndrome" where it relies on you having seen the first film in the series, and therefore takes very little time to establish anything that's already been established in Monsters Inc. I'm not saying this is a bad thing, it's just ultimately confusing for the future when you'll be unsure of which film to watch first. 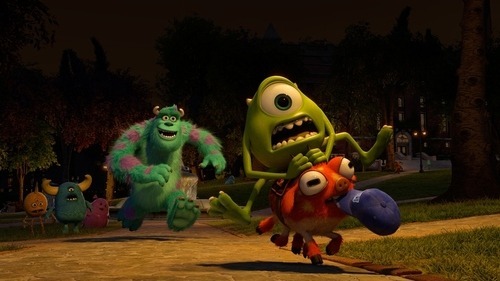 It similarly lacks the first film's heart, which came from the relationship between Sulley & Boo. Without a Boo-like character to base the film's emotional core around, it becomes nothing more than an an entertaining but somewhat hollow comedy. It does speak volumes, however, about the relationship between Mike & Sulley that it is enough to ultimately propel this film. Your goodwill towards these characters is most assuredly tapped into, and it makes you take an almost immediate liking to two characters who are, at least in this film, selfish and self-centered individuals. Granted they've got to have some adversity to overcome in order for the story to work, but they don't start off as particularly likable. Most of what I just mentioned is ultimately successful because of Crystal & Goodman's voice work. They have created two wonderful characters, and the energy and heart in their line readings keeps the film going. The supporting characters are all solid as well, with Joel Murray, Sean Hayes, Dave Foley, Peter Sohn, and especially Charlie Day, adding great characters to this world as the other members of the Oozma Kappa fraternity. It's nice to see another side of Steve Buscemi's villain from the first film, Randall, too, and Helen Mirren brings the proper amount of gravitas as Dean Hardscrabble. The film's design is gorgeous and fully realized, and it's definitely something to brag about. It's a lovely world to spend two hours in, and the technology is working at its very pinnacle. I should also mention the short film beforehand, The Blue Umbrella, which is done in amazingly photorealistic animation, but is similarly another story about two objects falling in love and then overcoming all manner of adversity to get together. It's nice and incredibly well-made, but it's nothing you haven't seen before, which is ultimately the problem with the feature film as well. Believe me when I tell you that the design, voice work, comedy and heart are not what's ultimately wrong with the film. It's the story by director Dan Scanlon, Robert L. Baird, & Daniel Gerson. It's just too trite and obvious and ultimately unnecessary. 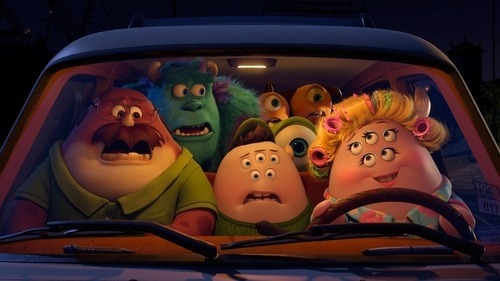 It's funny, it's cute, and it's fun to watch, but it's just not the Pixar I grew up loving. I'm hopeful that since the first film's director Pete Docter has turned his attention away from this prequel and towards telling a new story (Inside Out, set for release in 2015), that Pixar can regain some of its former glory. Otherwise, they're just going to become their parent company, Disney, and while that's not a bad thing, it's ultimately disappointing, because while they're still very good... they used to be great.